Israel has been accused of feeding secret information on the Iran 5+1 nuclear talks to senior US lawmakers in an effort to scupper the negotiations, a new report says. The accusation was met with sharp denial in Tel Aviv. The allegations were revealed in a Wall Street Journal investigation, and come from dozens of interviews with officials past and present, who are familiar with the nuclear discussions. Israel, for its part, claims that this was not accompanied by any official accusations by the White House. Defense Minister Moshe Ya'alon rejected the WSJ analysis. According to Israeli media, he said that "there is no way, and there was no way, that Israel spied on the Americans. That is seriously forbidden among every level of Israel's policy leaders." He added that the relationship between the two countries remains intact and that "someone is just trying to stir conflict... It's a shame that such winds are blowing into the clandestine channels in which we conduct this relationship." But according to WSJ's sources, it came as no surprise to the White House that Prime Minister Benjamin Netanyahu was continuing on his mission to derail a much sought-after agreement with Iran, as Tel Aviv remains implacably opposed to a nuclear Tehran, and has in recent past tried to involve the US Congress to impede a diplomatic solution offered by the 5+1 talks. However, it surprised Washington that Tel Aviv would feed the secret information to US lawmakers to drain support from a deal with Tehran. Washington and Tel Aviv have vastly different notions on how to deal with Tehran and how regional peace is to be secured. “It is one thing for the US and Israel to spy on each other. It is another thing for Israel to steal US secrets and play them back to US legislators to undermine US diplomacy,” a top US official close to the situation told WSJ. Israel’s alleged role in passing on information to US lawmakers emerged after US intelligence was snooping on the Israelis and heard information they claimed could only have come from the closed-door talks. Tel Aviv denied this, saying that they had acquired the information by different means, such as routine spying on communications with Iran. WSJ’s sources said that Israel tops the list of close US allies trying to spy on it, and that more US counterintelligence resources are spent on Israel than any other partner. Netanyahu has been trying to drum up support against the Obama administration’s push for rapprochement with Tehran from within the US government, as well as trying to sway US lawmakers. The fresh allegations of meddling by Israel could alienate US officials, many of whom are expected to be around after Obama’s term finishes. Last month, Obama’s cabinet accused Israel of “selective sharing of information” and “cherry-picking” as it publicly voiced its discontent with the ongoing talks. “Not everything you’re hearing from the Israeli government is an accurate depiction of the talks,” State Department spokeswoman Jen Psaki said. Two weeks ago, Netanyahu attempted to cancel a briefing for of a delegation of six US senators that Netanyahu’s idea of involving Congress in the matter would all but derail any deal with Iran. Eventually, Netanyahu had to back down and allow the briefing to take place. Tensions between Tel Aviv and Washington are already running high after Netanyahu delivered a controversial address to the US Congress, organized with Republican lawmakers but not the White House or the US State Department, in which he struck out at Iran, but, in Obama’s opinion, offered few alternatives to his previous line of aggressive engagement. The rift deepened further after Netanyahu said in his re-election campaign that Palestinian statehood would never happen on his watch. 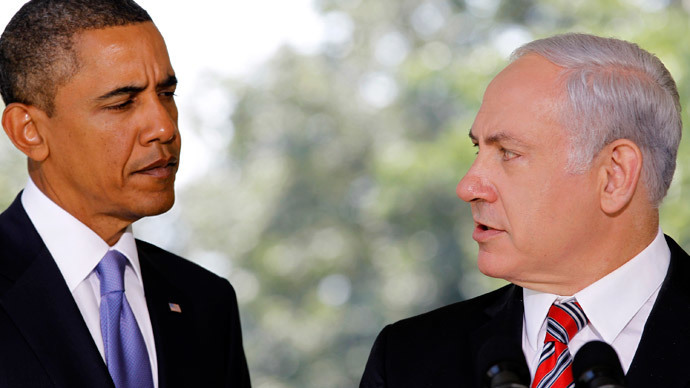 Relations cooled with Tel Aviv in 2012, when Obama decided to talk to Iran without Israel’s involvement – something Netanyahu reportedly did not appreciate. With these latest allegations of Israeli meddling in US politics, “people feel personally sold out,” one US official said. Israel appeared to be counting on a handful of Democrats in Congress to block the deal with Iran, the WSJ source said. “[T]hat’s where the Israelis really better be careful, because a lot of these people will not only be around for this administration but possible the next one as well,” the US official said.